In addition to filming, editing and sound Subvision can provide a complete post production service and specialise in compositing live action with animation. Editing - using our broadcast quality digital editing suite. Encoding - we can prepare your video for distribution on the internet, CD or DVD. This music promo is for Miriam's' first single 'Step Back From The Fire'. The band wanted a video that wasn't just performance based but also told a story in a striking and innovative way. The promo shows them create an idyllic setting for their music by drawing blazing mid air images that come to life. But their peace is soon shattered by a mysterious city that grows around them. The video threw up a few interesting challenges due to time and budget constraints. The band had to shoot their performances separately, the four members only playing together as a group when composited digitally. The green screen shoot did not allow for motion control so all the camera moves where produced in post-production. 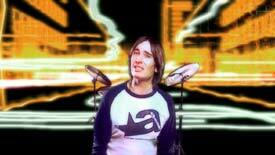 The footage of the band was also treated to add flickering flame effects and glows. A taster of the video is presented here but watch your screens and the Festivals for the full version. Subvision have completed two sequences for BBC Broadcast. The sequences form part of the new Opening for the CBBC channel, which will be aired each morning from March to September this year. 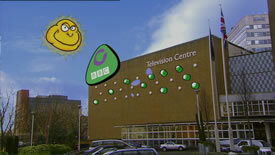 The Opening starts with the transformation of the BBC TV Centre into a cartoon version that houses the CBBC studios. Subvision enhanced the live footage of the BBC Building. A new sky was added complete with fluffy clouds and the whole scene was re coloured. 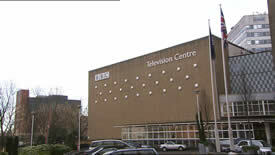 The transformation was built up from layers of animation as different parts of the building appear to form the CBBC TV Centre. Although the computer models where 3D they were treated with a Toonreyes renderer a process which flattens the colours to give them a traditional 2D cartoon look. The second sequence is an animated version of Jake, one of the CBBC presenters, having a Kung-Fu fight with a green CBBC bug. See the animation section for details. The pilot for Carltons' new childrens' show was created entirely at Subvision. 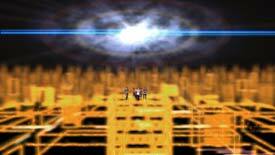 The three main characters live in a 3D world where there is always something new to learn. When curiosity gets the better of them they fly into real world interacting with kids and spreading their own brand of fun. Each of the characters were composited into live action footage to produce this illusion. See the animation section for details of the Impz in their world.